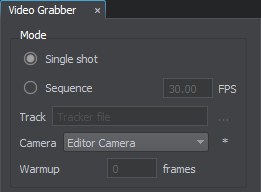 Video Grabber is a UnigineEditor tool for high-quality capturing of screenshots and frame sequences. Frame sequences are captured in a special non-real-time mode, allowing to get any fixed FPS even on a low-end hardware. In comparison with traditional CPU-based offline rendering, this tool allows much faster rendering thanks to GPU acceleration. Video Grabber supports capturing of screenshots with extremely high resolution: 4K or even 8K images can be taken with a regular monitor. Also Video Grabber supports the professional EXR format in addition to the standard TGA, JPG, PNG and PSD formats. 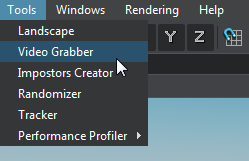 To open the Video Grabber tool, choose Tools -> Video Grabber in the Menu Bar. The captured screenshots can be processed by a special video utility to make a video file. The tool is available only in the Engineering and Sim editions of UNIGINE SDK. The Video Grabber tool provides the settings described below. 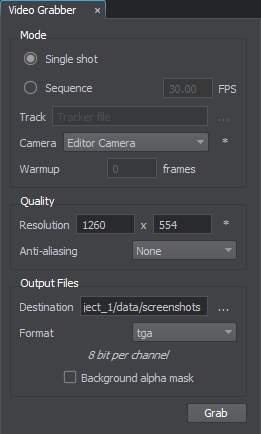 Take a sequence of screenshots with the specified FPS according to the loaded *.track file. The frame rate of the track animation to grab. This option is available only when the Sequence option is set. A path to a *.track file. This option is available only when the Sequence option is set. Camera, the viewport of which should be captured. To update the list of available cameras, click to the right of the Camera field. Warm up of the video grabber: the number of frames to skip before capturing the viewport. It is used to reduce visual artifacts. This option is available only when the Sequence option is set. The output resolution. To set the output resolution to the current viewport resolution, click the button to the right of the Resolution field. If you specify very high values, a warning may appear. The anti-aliasing mode for the output image: the image is captured with the output resolution multiplied by the specified value (by 2 or 4) and then it is resized to the initial output resolution. A path to a folder, into which the screenshots will be saved. The label under this field displays the bit depth of the chosen format. If the option is enabled, the transparent background will be captured. If the option is disabled, the background will be captured regardless of its transparency. The option is available for all output formats except JPG. On the Menu Bar, choose Windows -> Video Grabber. The Video Grabber tool window will open. Choose the mode of the viewport capture, choose the camera that will be used for capturing, specify the required quality and output settings.